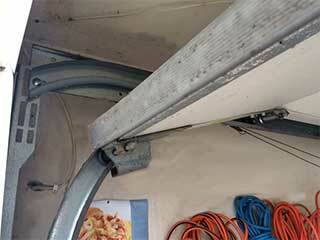 If your garage door doesn't work as well as it's supposed to, you will naturally want to find out what’s wrong. Is it the springs, the opener, or something else? Let’s take a closer look at some of the most common malfunctions that you may experience, how they occur, and how they are fixed. When stops all of a sudden while opening or closing, the issue is most likely with one of its tracks. It could be blocked, bent or broken. The solution is cleaning, straightening, or replacing the component in question. Although cleaning the track is something you may be able to do yourself, any type of repair or realignment task should be left to our professional technicians. Your door relies on the tracks to guide the movement of its rollers, and therefore they must be in an excellent condition at all times. There are two possible things that can cause this type of issue. You may be dealing with a broken spring. Just look up to see if this is the case. Remember that you must never operate the door while a spring is broken. This is extremely dangerous and can seriously damage other hardware parts. The other possible cause of this problem is a broken trolley. This is the component which is driven back and forth along the opener’s rail to open and close the door automatically. The solution to both of these situations is to replace the part in question, and in both cases the job needs to be done by an experienced service specialist, like our team. It's far too dangerous to try and perform this type of procedures by yourself. Finding the culprit shouldn't be too hard here. It's usually one (or more) of the tracks. If they become damaged or dented, the rollers could slip off, which will result in the door nearly collapsing. A bent track will need to be either repaired or replaced with a new one. Naturally, since realigning the door with the new track will be required, you'll probably want to leave this up to our experts. There are a lot of additional problems that could start plaguing your garage door over time, from noisy rollers that require lubrication to unadjusted springs that leave the door partly open. The best way to prevent a lot of issues is to make sure your system undergoes regular maintenance. Our team at Garage Door Repair Pasadena can offer you routine service appointments which will also extend the system's lifespan. Call us today to schedule an appointment. If you are in need of professional garage door repair services, then we're the team to call. We've been fixing systems of this type for over a decade, and we've adapted and perfected our methods over the years to now be able to find the best and most affordable solution to any problem. Book an appointment today by using our online scheduling system. When you hire Garage Door Repair Pasadena, you get the best service, the best products and the best results on every call! Our technician will contact you before arriving. Until then, feel free to browse our website! Garage Door Repair Pasadena is at your service!